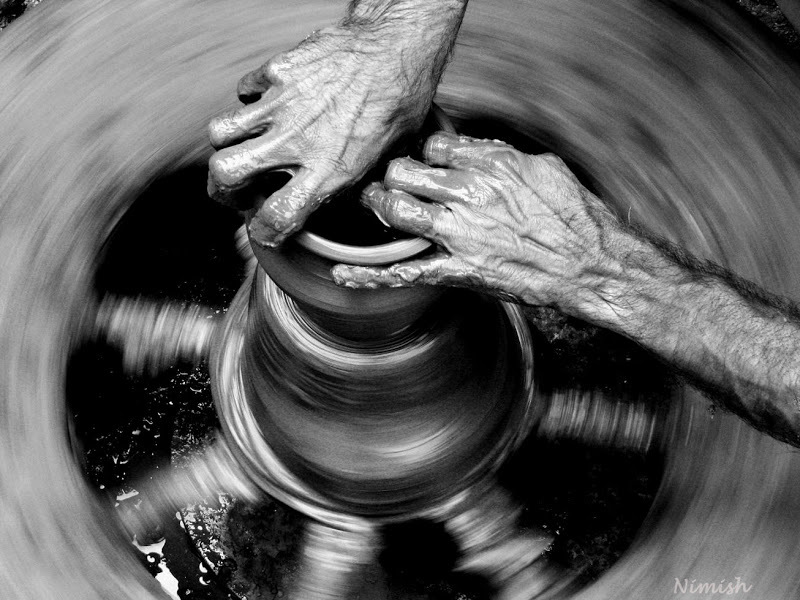 We are the clay, and you are our potter; We are all the work of your hand. When astronauts are in outer space, they spend their free time looking at Earth. When you need to know the truth, who do you listen to? Not the Mayans, evidently. The Bible tells how God calls people to take on a great task. Sometimes there is a journey involved, and sometimes people have to do something that is dangerous. When the angel appeared to Mary, a young woman in Nazareth, she was told that God was calling her to do something very special. She was chosen to join her humanity to God’s creative purpose, and to bring Jesus into the world. 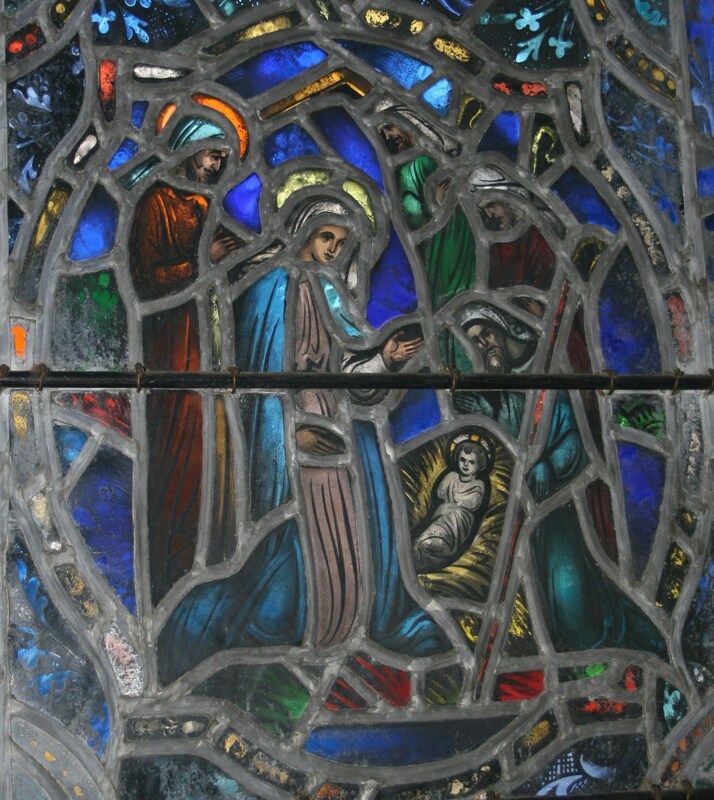 The task was dangerous–Mary did not have the protection of a husband. And she set off on a journey, to stay with her cousin Elizabeth. And her brave response was to sing a song of joy, and to say that she felt blessed by what God asked of her, in a song we call: the Magnificat. She knew that what God was doing would bring justice to the world, and she remembered his promise of mercy. Though she was a humble woman living in a small village, Mary rejoiced that she could say yes to God. That God became human is the greatest of miracles. That God became incarnate in Mary before God was incarnate in Jesus is a beautiful mystery. That God became poor and vulnerable is a truth that we continue to ponder in our hearts. What have you been told about the day you were born? If you were Mary, what would have been the hardest thing to understand? That you spoke with an angel? Who your child was going to be? That God had chosen you? If an angel were to tell you about something God wanted you to do, how would you respond? Ask a lot of questions? Be happy? Worry? Run away? Gladly obey? 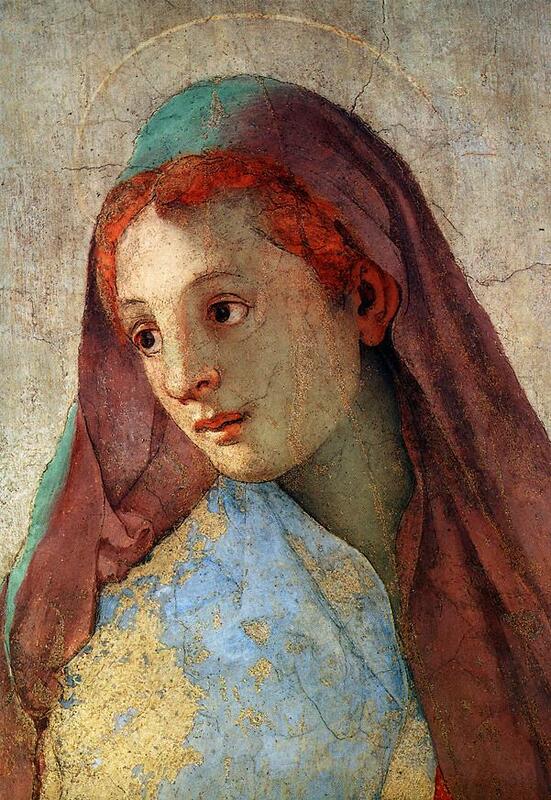 Here is a children’s activity page related to this sacred story: about the Virgin Mary. My mother’s favorite Biblical character is John the Baptist. She goes right back to her memories of childhood Sunday school when she hears the description in Mark 1:1-8 of John “clothed with camel’s hair, with a leather belt around his waist, and he ate locusts and wild honey.” He is the ferocious prophet in the New Testament who looks and sounds like the vigorous, loud prophets we know from the Old Testament. He even quotes an O.T. 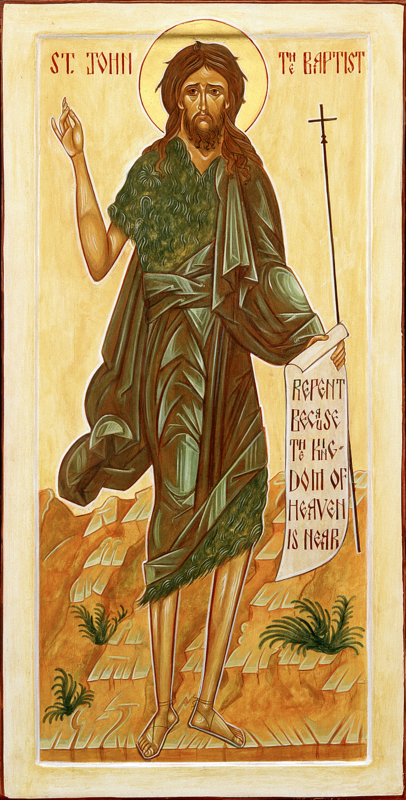 prophet: Isaiah. The Gospel of Mark starts with John, because he is predicting the coming of Jesus, who we first meet in Mark as an adult. John is in the wilderness baptizing the people who came to hear him preach, and who want a new beginning of life. He cries “Repent!” In the original Greek the word is “Metanoia” meaning to turn around or to change your thinking, to have a change of heart. My nephew Jaime, when he was little, and unhappy about something, used to cry out: “Rewind! I want a rewind!” Even little ones know that they need a fresh start to erase a mistake. By washing people in the river Jordan, John was using a ritual to give people a fresh start–a new way of being that would prepare them for the new world that was coming with the arrival of the long hoped-for Messiah. John is the one who baptized Jesus, and when he came out of the water the Holy Spirit landed on him like a dove. And that was the beginning of Jesus’ ministry. How do you get a fresh start? If you walked miles into the wilderness, what would you be hoping to see? Do you remember being baptized? What do you think when you see people being baptized in church? How do you know when something important is happening to you? John the Baptist, as described in the Gospels: Mark (last week) and in John (this week) is an important figure. When Mary left home after her encounter with the angel (the annunciation) and when she was carrying her child, she went to her relative Elizabeth–who was pregnant with John. Jesus was born in fulfillment of God’s promise to the people of Israel. They hoped for a king from the lineage of the greatest king of Israel–David. David was a shepherd, from the town of Bethlehem. Jesus was the same, and so much more. Beth-lehem means “house of bread” in Hebrew, and after Jesus was born there, he was placed in a manger–a trough where animals were fed. Jesus is the one who grew to feed and care for a hungry people. Jesus as savior restores a broken world to wholeness, gives sustanence, and brings the gift of peace–and we experience the mystery of all of that when we receive communion. The precious child of God became a human being in a safe place warmed by the bodies and breath of animals, nestled in a bed softened by straw and watched over by loving parents. I pray that all children may be as blessed. Click on the link above–don’t miss it! It is a way to help us slow down, reflect, and focus on our priorities during the upcoming season. The following is from Amy Cook’s newsletter. Thomas Mousin, newly installed rector at St. John’s, Charlestown, has once again created a downloadable Advent Calendar for churches to use which starts on the first Sunday of Advent. Thanks again Thomas for this lovely gift of the season. And be to take a look at his cards that are linked here. Episcopal Relief and Development has an Advent Calendar poster around the work that they do. Consider using this and their other Advent materials to raise money for ER&D. Their Advent program includes online videos and a story of hope everyday from somewhere in the world. It can be used as an educational program, or simply read the stories each day as your own Advent devotional. Trinity Episcopal Church, Wall Street posts an online Advent calendar every year. Check out their stories every day as a new page is day is revealed. Belief Net offers an online Advent Calendar that reveals information about the season and Advent and links you to articles every day. I always enjoy the Paperless Christmas calendar from the UK. This is a highly imaginative take on putting the Christmas story in a present day context. Could spark some youth to create their own. Must wait for Advent 1 to see the first video. Consistant high quality and theologically sound materials can be found at Candle Press. Check out the beautiful Advent Calendars, Advent table cards, booklets, and wreaths. Carolyn Brown has some great suggestions and ideas for churches to help them celebrate Advent and Christmas. Be sure to look first at TEN PAGES of IDEAS for Advent and Christmas from Sharon Pearson at Church Publishing. The Diocese of Jerusalem has some good educational materials for churches. This set of Children’s Lessons for each Sunday in Advent help children to set the stories of the Bible into the real lands of the Middle East. The are all taken from the Gospel of Luke and were posted in 2010, but could be used at any time. Vanderbilt University has a fantastic site for the Revised Common Lectionary. 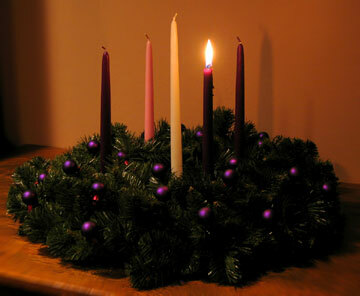 Check out the (Advent table for Year B) to find art and prayer links for each Sunday’s reading. Great Ideas for families can be found at the Faith-At-Home site run by a mom and Godly Play teacher who does a great job of connecting faith in the family.